Wed, 3 May 2017 at 7:19 p.m. Message: Last Thursday (27 April) I presented the remainder of my submission on Natural Hazards. Notes attached in case they might help anybody’s further efforts. I have no property interest in any landslide hazard area (although I did previously), nor in the Water of Leith catchment, nor in South Dunedin. My main purpose in appearing at this stage is to bring to the panel’s attention that the expert (so-called) opinions received from Otago Regional Council’s (ORC) natural hazard analysts are often deficient to the detriment of the 2GP process and the city’s residents. I am a long-term resident of Dunedin and am highly experienced in flood control issues and solutions. I am appearing here on my own behalf, therefore not strictly as an Expert Witness in this instance, although I have done so in past years both in both the High Court and the Environment Court. I also acted as lead technical advisor to the NZ Govt investigation into the massive 1999 Clutha flood. My detailed investigations have ranged from simple issues such as the Water of Leith (as Investigations Engineer at Otago Catchment Board and ORC) to the entire Clutha catchment (in varying roles). These investigations have often incorporated the construction and operation of accurate, properly verified models. I am now semi-retired MIPENZ, but still running my own consultancy on a reduced basis. I am a highly experienced expert in flood issues, I am much less so wrt landslide identification and mitigation (but I know a nonsensical report when I read one). ORC hazard analysts responsible for the landslide buffer zones originally imposed across my former property (and many others) need to accept that their approach was seriously flawed, and far from expert. Paul Freeland has mentioned to me in a recent phone conversation that Dunedin City Council (DCC) should be able to have confidence that ORC hazard analysts are expert. I have no strong criticism of Mr Freeland, but those days have passed – in this region at least – when expertise was based on proven performance, and not on a position’s title. A property previously owned by my wife and me in Porterfield Street, Macandrew Bay was quite ridiculously misrepresented in ORC’s landslide report of September 2015. The landslide hazard zone on that property has apparently now been removed, but uncaring damage has been done to us, and no doubt to many others. The Hazard 2 zone was reportedly imposed without site inspection, or without anybody properly reviewing output or checking accuracy of references. The comments re South Dunedin flood hazard contained in my original written submission were written prior to DCC’s producing its inaccurate flood reports in respect of the South Dunedin flooding of early June 2015 in which high groundwater levels were held to blame. These DCC reports were eventually released in late November 2015 and April 2016 respectively. My analyses (well after my original submission) demonstrated that the prime cause of widespread flooding in South Dunedin was DCC’s failure (in order of probable significance) to utilise the bypass facility at Tahuna Wastewater Treatment Plant, to fully utilise its stormwater pumping capacity at Portobello Road, and to maintain its stormwater infrastructure (mudtanks etc). Inflow of “foreign” water from the St Clair catchment added to the depth of inundation in some areas. All these can be remedied by a diligent Council. Some have already been remedied, as positively demonstrated in the admittedly rather over-hyped rain event of the subtropical cyclone remnant around this past Easter. ORC natural hazard analysts were probably responsible for the origin of the groundwater myth as a cause of the South Dunedin flooding in their Coastal Otago Flood Event 3 June 2015 report. Reference was made there to “elevated” ground water levels. They followed up with a contentious report (The Natural Hazards of South Dunedin, July 2016). This opens by stating that the June 2015 flooding was caused by heavy rainfall and high groundwater levels, with no mention of mudtanks, or pumping failures (plural). Such reporting cannot be treated as balanced, nor its authors credible. Elsewhere, ORC essentially conceded the groundwater myth in Rebecca Macfie’s excellent NZ Listener article entitled Flood Fiasco (June 11, 2016). Shortly after, however, ORC produced the aforementioned South Dunedin Hazards report (backed up by an embarrassingly inaccurate video presentation) that seems to reflect a desire to preach doom rather than convey a balanced defendable scientific analysis of South Dunedin realities and solutions where needed. • Each of these uncertainties could have the effect of overestimating the groundwater ponding in the current setting. The reader is advised to read the full Section 3.8 to ensure contextual accuracy. In my view (as an experienced modeller), a study that cannot even replicate known existing relationships is imperfectly calibrated and unverified. It cannot therefore be relied on. Strictly speaking, it does not qualify as a model. The relationship between possible sea level rise and consequent groundwater impact remains highly uncertain. Unfortunately, the 2016 ORC South Dunedin Hazards report (and video) chose to reproduce the 2012 ponding predictions using more recent data (but without any better appreciation of aquifer characteristics), but the predictions are similar. It is noted that no Scenario 0 mapping is included in the latter report, nor are the model’s inherent weaknesses described. No admission of the potential modelling inaccuracies is presented other than the following note in Section 4.1: “Further discussion of the original model parameters, model calibration and potential pitfalls is included in the ORC (2012a) report, which can be accessed on the ORC website”. I believe that all parties were entitled to know unequivocally that the modelling was unreliable and unverified. The 2016 report also makes reference to the fact that dry-weather ground water levels at the Culling Park recorder are at or below mean sea level. This is attributed by the authors to leakage of ground water into the stormwater and wastewater sewers. If that is correct (I would reserve judgement as to whether there may be other factors), then we are witnessing just one example of how an engineered solution could be utilised to dissipate increasing depth of groundwater. Such solutions are canvassed in the BECA report commissioned by DCC several years back. To summarise, South Dunedin’s exposure to flood (current or future) is poorly described by ORC hazard analysts. The 2GP process seems to have seen these analysts “adopted” by DCC planners as their experts. I consider that to be an inappropriate approach to the detriment of our citizens. The proposal to require relocatable housing in South Dunedin seems premature, and based on highly questionable information. The proposal for relocatable housing in South Dunedin also rather pre-empts the currently-planned DCC study of overseas approaches to sea level rise solutions. Requiring relocatable houses will likely simply mean that aged houses that should in time be replaced will be repaired instead. Who is going to build a new relocatable house if they have nowhere to relocate to and probably insufficient money to acquire the requisite land? The proposal to require relocatable housing is ill-considered and premature in my opinion. The reason for my pointing out these facts is to encourage Commissioners to take a step back from the current hysteria surrounding South Dunedin. Had the 2015 flooding extent been restricted (as it should have been) to that which occurred in a slightly larger rainfall event in March 1968, the event would have already been forgotten. Seemingly, at least partly as a result of that hysteria, the proposal to require relocatable housing in South Dunedin seems premature, and based on highly questionable information. Just as ORC floodplain mapping contradicts its in-place flood protection philosophy, so does the proposal for relocatable housing in South Dunedin also rather pre-empt the currently planned DCC study of overseas approaches to sea level rise. Requiring relocatable houses will simply mean that aged houses that should in time be replaced will be repaired instead. Who is going to build a new relocatable house if they have nowhere to relocate to and probably no money to acquire the requisite land? The proposal for relocatable housing is ill-considered and premature in my opinion. ORC’s mapping is said to be of residual flooding (post-flood protection works of the past 80-plus years), but actually represents what might have been envisaged many decades back in something considerably greater than the record 1929 flood with none of the very significant channel works of the 1930s, 1940s and 1960s; or even those lesser improvement of the 2010s in place. The ORC 2GP mapping includes areas that didn’t get flooded in 1923 or 1929. I agree with some potential dangers of stream blockage (especially in Lindsay Creek, and to a lesser extent at Clyde Street and Rockside Road), but one can only consider locations of feasible blockage in today’s conditions. Furthermore, accepted professional practice for flood plain mapping requires detailed hydrology, probability analyses, climate change allowance, hydrograph routing, in-channel modelling (allowing for stream capacity variability), and overland flow modelling. ORC’s flood mapping incorporates none of these fundamentals; instead, it reads as little more than a colouring-in exercise, when a professionally researched technical document is required. In short, ORC’s hazard analysts have carried out no fit-for-purpose analysis for a District Plan process. Interestingly, the concerns expressed by ORC hazard analysts re channel blockage are entirely inconsistent with ORC’s own design philosophy and consent application evidence for the recent Flood protection scheme (so called). Design Philosophy minimises the issue. No descriptions of the effective flood protection initiatives (OHB -1920s and 1930s, DCC -1940s, OCB -1960s) are included. These works have ensured that overtopping is practically impossible in the George Street to Cumberland Street reach, the Clock Tower reach and Forth Street to Harbour reaches. Flood protection in these areas are all built to a much higher hydraulic standard than the so-called ORC scheme of the past decade, and to a far, far higher standard than existed pre-1929. It is further noted that ORC’s own Design Philosophy Report (OPUS for ORC, 2005) for the proposed Leith/Lindsay flood protection scheme is adamant that debris traps recently (then) constructed at Malvern Street and Bethunes Gully would further mitigate any debris problems. Refer paras 7.7 and 10.6 of that document. Ponding is mapped where water couldn’t even reach in 1929 (peak flood currently estimated at 220 cumecs, and predating flood protection measures) in the wider CBD area. Flows along George Street in the 1920s only occurred south as far as about Howe Street, then re-entered the river. Nowadays, the accelerating weir above George Street and the structural high velocity channel immediately downstream provide much more clearance than existed in 1929. [Most outflow then from the river occurred much further downstream.] In those downstream reaches, many of the bridges have been replaced or upgraded. Possible remaining points of interest are the hydraulically insignificant extension (circa 2015) of the St David Street footbridge, the historic Union Street arch footbridge, and the widened (circa 2012) Clyde Street road bridge. The flimsy St David Street bridge would not survive any hydraulic heading up so there would likely be of little flood consequence, and backing up upstream of Union St would be largely inconsequential because of the height of the Clock Tower reach banks immediately upstream. The Clyde Street bridge is acknowledged as being lower than optimum, but it has not created any issues in its half century existence. Any overtopping there could only impact on a limited area between the bridge and the railway line. Overland lows beyond (east of) the rail line remain highly improbable because of the ongoing blocking effect of road and rail embankments. Flows as far as the railway station to the west of the rail line are also highly improbable nowadays as only the Clyde Street area could conceivably contribute. • Portions of Caversham, South Dunedin, St Kilda, the lower portions of central and northern areas of the City and North East Valley were completely inundated. • Water in South Dunedin was waist deep. • The Water of Leith rose considerably and burst its banks in many places, causing extensive damage along its banks and flooding low-lying areas. Today’s stormwater infrastructure is rather more extensive and effective (when maintained), and DCC has a continuing legal obligation to provide to maintain that service. The levels plotted across Lindsay Creek seem highly pessimistic. Levels are shown to be of the order of 2 metres above North Road in some locations at least. I have [no] knowledge of any such levels ever having been approached. Care must be taken not to include unfloodable areas in the mapping. I don’t however discount localised channel blockage, and the channel capacity is substandard in many areas. The valley slope ensures that overland flow will achieve damaging velocities. Such velocities are noted in the NIWA summary. The river channel through here is both steep and confined. The influences of Pine Hill Creek (immediately upstream) and Ross Creek (immediately downstream) add to turbulence and bank attack. The area was ravaged in 1923 and 1929, and there have been evacuations in some much lesser events in later decades. These areas are at considerable risk in a 50- to 100-year plus event. Hardin Street, Malvern Street had houses evacuated in the 1960s flood. High velocity, rock laden flows and mudslides can all be anticipated, and difficult to counter. Area below camping ground / Woodhaugh was overwhelmed in floods of the 1920s – a focus for flooding depth and velocity. If the 2GP process is to include urban flood maps, these should be diligently derived, based on historical record and appropriate modelling. The mapping should reflect the real flood risks (including likelihood, velocity and depth). The decreasing flood risk from Woodhaugh (potentially high impact) through North East Valley (moderate impact) through to the main urban area south of the Leith waterway (localised and of little-to-zero impact) should be reflected in the mapping. █ For more, enter the terms *johnstone*, *flood* and *south dunedin* in the search box at right. █ Site zoned industrial under district plan and proposed 2GP. █ Company lobbying to evade set condition for 10.5m setback —for own commercial gain. 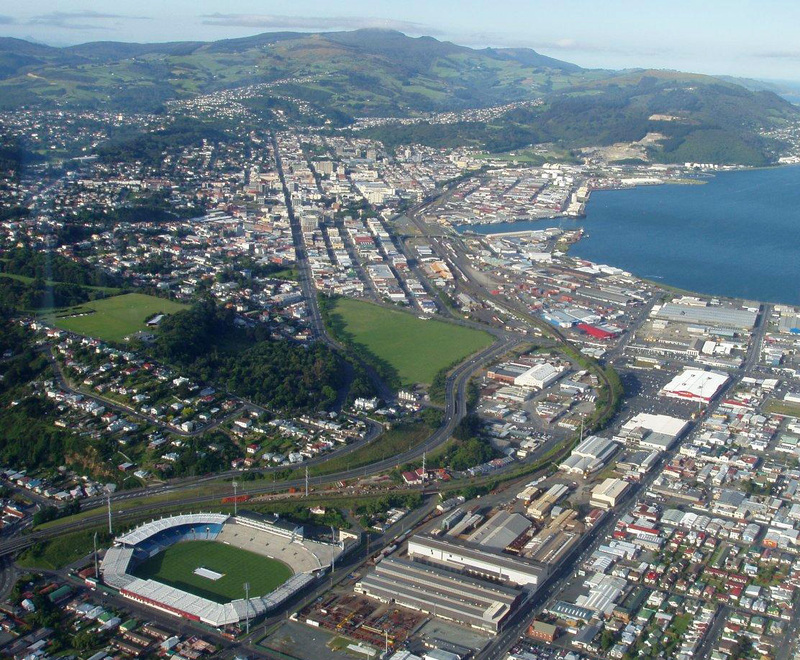 The company that owns the former Carisbrook Stadium site in South Dunedin is calling on the Dunedin City Council to scrap a 10.5m setback suggested for its Burns St frontage. Calder Stewart says the setback will cover 1963sq m of land worth about $600,000, and will not provide the benefits suggested in the second generation district plan (2GP). The company took its concerns to the 2GP hearings last week, as a hearings committee considered what the next district plan will look like. […] Research undertaken by the University of Otago had shown South Dunedin had a low population of native birds because of a lack of habitat, and planting of native or exotic trees there would provide a valuable habitat resource. Carisbrook was a major sporting venue in Dunedin, New Zealand. The city’s main domestic and international rugby union venue, it was also used for other sports such as cricket, football, rugby league and motocross. Carisbrook also hosted a Joe Cocker concert and frequently hosted pre-game concerts before rugby matches in the 1990s. 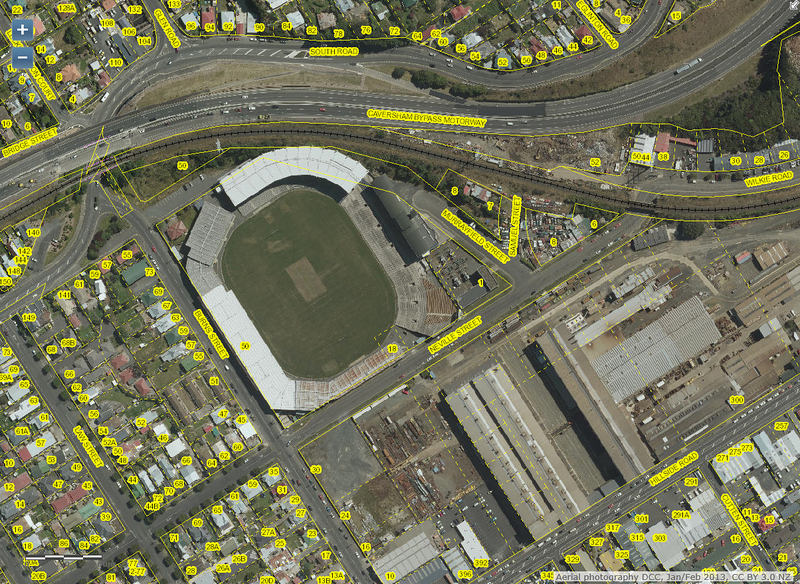 In 2011 Carisbrook was closed, and was replaced by Forsyth Barr Stadium at University Plaza in North Dunedin. Floodlit since the 1990s, it could cater for both day and night fixtures. Known locally simply as “The Brook”, it has been branded with the name “The House of Pain”, due to its reputation as a difficult venue for visiting teams. Located at the foot of The Glen, a steep valley, the ground was flanked by the South Island Main Trunk Railway and the Hillside Railway Workshops, two miles southwest of Dunedin city centre in the suburb of Caversham. State Highway 1 also ran close to the northern perimeter of the ground. Carisbrook was named after the estate of early colonial settler James Macandrew (itself named after a castle on the Isle of Wight). Developed during the 1870s, it was first used for international cricket in 1883, when Otago hosted a team from Tasmania. It hosted rugby union internationals since 1908 and full cricket internationals since 1955. 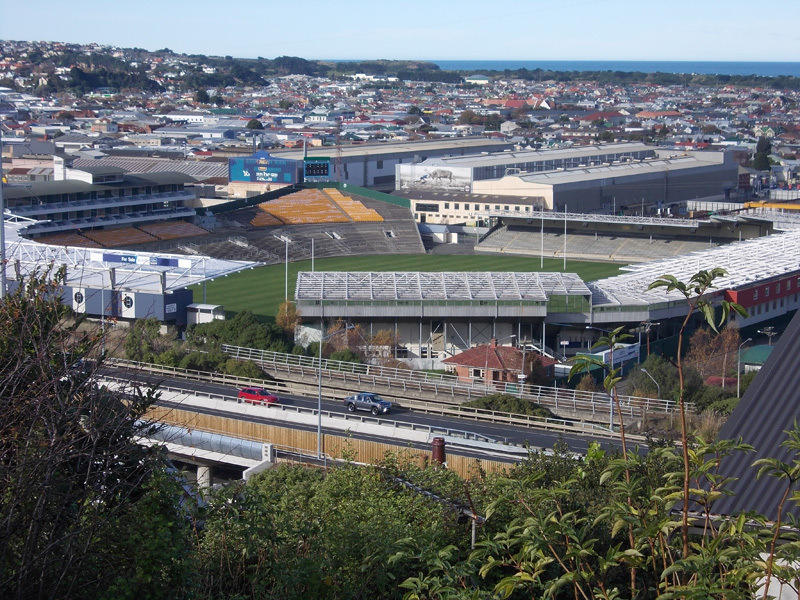 The stadium was home to both the Highlanders in Super Rugby and Otago in the ITM Cup through each side’s respective 2011 season. It is also the former home of Otago cricket, which moved to the University Oval at Logan Park in the north of the city after the redevelopment in the early 2000s, and also of Otago United Football team in the New Zealand Football Championship, which moved to the lower-capacity Sunnyvale Park for the 2008–09 season. Where is the unreserved DCC apology to the Community of South Dunedin ? And where are the Opus International ‘peer reviews’ for public scrutiny. All we have is the self-congratulatory propaganda from DCC and the motley crew, propagated by friends at ODT. We hear from inside DCC that the peer reviews are not up to much. News. Farce. Like an incessant rash. Mon, 4 Jul 2016 at 12:29 p.m. I, Sam the Eagle, present a musical salute to America. Sent: Monday, 4 July 2016 11:55 a.m. If you wish to discuss this further with us, please feel free to contact the chief executive and request an appointment. Tue, 21 June 2016 at 7:29 p.m. 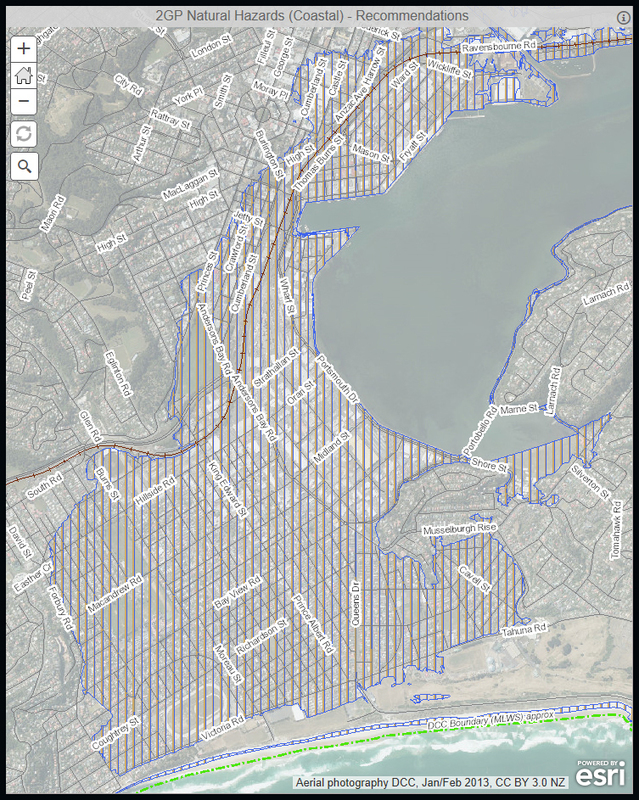 Message: In the light of concerns last night [South Dunedin public meeting] about the effects of the Proposed 2GP on South Dunedin, suggest you extract the Hazard Zone portion and post it on What if? The following report by Anna Johnson shows that very little was done [public consultation] in 2014. In fact only 17 people turned up to the DCC workshop in South Dunedin and their Appendices show that less than 10 people commented on their draft natural hazard policy. *Bullet points indicate comments entered after the public meeting 20 June. █ For more, enter the terms *flood*, *sea level rise*, *climate change*, *pce*, *stormwater*, *hazard*, *johnstone*, *hendry*, *south dunedin action group*, *debriefing notes* or *listener* in the search box at right. Election Year. This post is offered on the public interest. Friday, 6 May 2016 6:02 p.m.
Further to my last email here is the notes taken by office from the meeting with the Mayor and senior Council management on 3 May. This is to keep you informed and for transparency purposes. – Council was now very sceptical about evidence relating to the flood and had been let down. He added that they would not make any changes to anything without evidence. – Unable to provide a figure on the number of roads closed by DCC as the water washed the cones away. █ For more enter the term *flood* in the search box at right. Thanks for copying us in. May we know when you requested that the mudtanks were cleaned thoroughly? I had thought that it was an initiative from Ruth Stokes, as part of the looking into and reporting back on the flood. I am also interested in your “fact” that the stormwater system is not capable even at optimal condition and performance……. 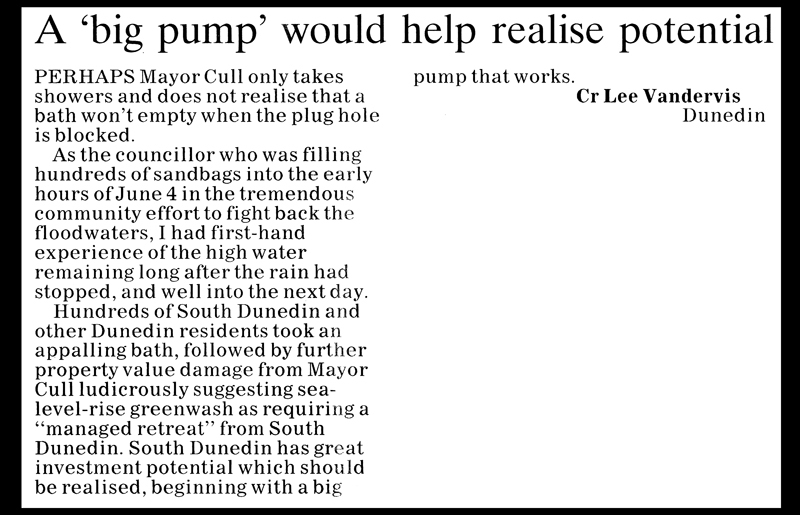 Do you mean that it was not then, or that it would not be even if we made adjustments and sorted out the mudtanks and fixed the screen/pump and made changes which we have signalled to the general stormwater system which flows through South Dunedin? If council modelling showed the extent of the flooding would be precisely as it was in the event of that magnitude, what relevance had the problems with the screen/pump and the mudtanks? I guess all the problems in South Dunedin during the flood were localised problems and many of them as a result of water lying about, so did our modelling show that as well? I understood that there was still more work to be done to understand what we could best do particularly about the interconnection between the water from various sources and what we could afford of the options available. Do you see the governance part of the Council completely blameless in this process? Since you have apparently arranged for the mudtanks to be cleared, surely you/we could have done something sooner. Do we have a role at all in your view, apart from advising people they are wrong when it turns out we may have incomplete information? As seems true for all of the information surrounding this horrible flood, the more information we receive the more questions we have. 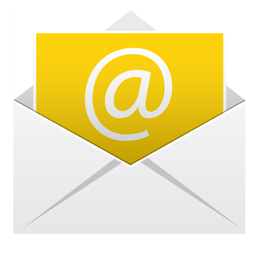 Thank you for your email. I am puzzled by the apparent assertion that I have blamed the 2015 June flooding on Climate Change. While that may be the root cause I don’t recall saying that. The cause of the flooding, as has finally been comprehensively reported (for a meeting today) was the fact that the stormwater system in South Dunedin is not capable, even at optimum condition and performance, of coping with the amount of rain that fell over that period. That is a simple calculation given the capacity of the system in both volume and pumping terms, and the severity of the event. The mudbank maintenance failure was reprehensible from both a contractor and staff oversight perspective, especially as exactly the same issue had been raised some four years ago and assurances given that it would not happen again. The fact that some mudbanks were not up to scratch may have caused some localised problems and perhaps prolonged the water lying, but they did not cause the extent of the flooding. That was exactly as Council’s modelling showed it would be in an event of that magnitude. Six years ago Council received reports stating (among other conclusions) two things. First that more frequent and severe rain events were likely. Second that the stormwater system in South Dunedin was not capable of handling those. So flooding was very likely. Last year the Parliamentary Commissioner for the Environment issued a report showing that rising ground water, pushed up by sea level rise will increasingly afflict South Dunedin. It’s most important to recognise that while stormwater and groundwater can each affect the other, they are different and have different causes. The failure was operational and managerial as Council was repeatedly assured that maintenance was up to scratch. Council’s challenge now is to address both stormwater and groundwater issues. We have already, at my request, ensured that the stormwater system is in the best shape possible as winter approaches, by having all the mudbanks cleaned properly. Additionally the screen at the Portobello Rd pumping station, which was blocked by debris carried by the overwhelming amount of water, will be replaced by July. Council will consider that report which has taken such a frustratingly long time to get to us, and determine the next necessary steps. At your request I have copied this to all elected members. 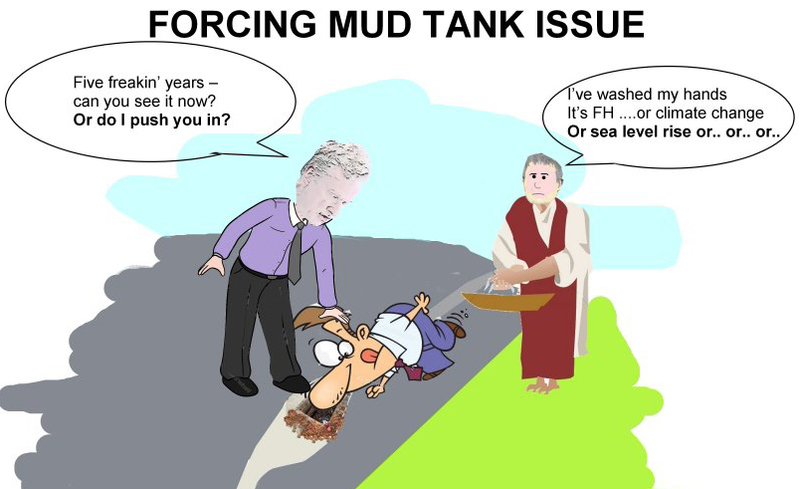 A series of emails released by Dunedin city councillor Lee Vandervis show he was raising concerns about the state of Dunedin’s mud-tanks as long ago as 2011. Cr Vandervis said he released the emails because only publicity forced the council to change its ways. “This publicity is going to make sure it really is sorted once and for all this time.” The release of the emails follows a report released by the Dunedin City Council last week into last June’s flood, which found 75% of mud-tanks in South Dunedin were not properly maintained. Council staff were responsible for not properly overseeing mud-tank maintenance in South Dunedin, not councillors or the mayor, a senior staff member says. Council infrastructure and networks general manager Ruth Stokes started today’s council infrastructure services committee meeting by apologising on behalf of council staff for the failings identified in a report on last June’s flood. Dunedin Mayor Dave Cull and Crs David Benson-Pope and Lee Vandervis were among those who had raised mud-tank performance prior to the South Dunedin floods, and been given incorrect information by staff. “For that I would like to, on behalf of the executive, apologise,” Ms Stokes. The failure was a management failure and not governance one, she said. Submitted by JimmyJones on Tue, 26/04/2016 – 1:49pm. Mayor Cull says he is outraged at the failure of Fulton Hogan and council staff to adequately ensure that the mudtanks were in working condition. He should also be outraged at his own poor leadership and failure to respond to developing problems. Under his leadership the city continued to build up a backlog of worn-out stormwater pipes and equipment waiting for funding to be allocated. With this lack of funding we have seen the inevitable result of a deteriorating stormwater system. The poor state of the stormwater system was the primary cause of the severity of the flooding at Kaikorai, Mosgiel and South Dunedin last year. This under-funding of the stormwater renewals is not an accident. Every year the DCC Mayor and councillors decide and vote on this spending – and every year they vote to under-fund the stormwater renewals because they think that a new stadium and a new swimming pool and more bicycle lanes are more important than a functioning stormwater system. The Annual Plan shows that the under-funding will continue next year. Expect the deterioration to continue. █ For more, enter the term *flood* in the search box at right.